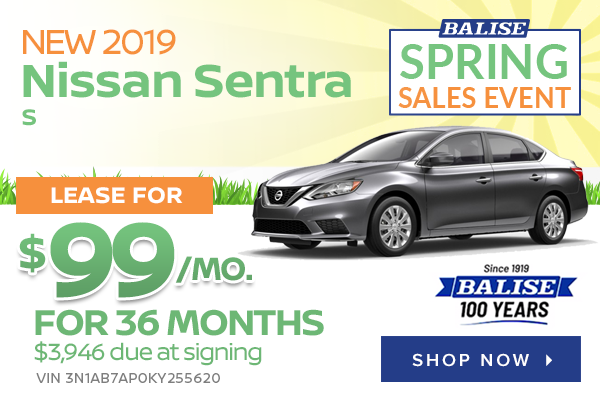 New 2019 Nissan Sentra S with automatic CVT transmission (STOCK# ZN9104, VIN 3N1AB7AP0KY255620) $99 per month lease for 36 months. $2699 cash/trade down + $99 first payment + $498 doc & title prep + $650 bank acq fee + $0 security deposit = $3946 total due at delivery. Sales tax, title and registration fees additional. 12,000 miles/year. Lease selling price $19,233. Lease end buy option = $9494. MSRP $19,780. All incentives to dealer, cannot be combined with other offers. Available to well-qualified buyers with Top Tier credit, not all will qualify. Offer ends 4/30/2019.